Description: Nelson, London, 1919. 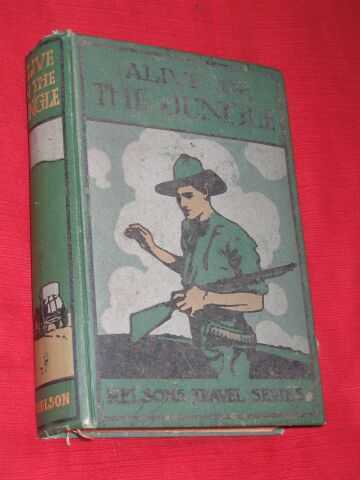 Reprint, Green Cloth, Illustrated by: Stewart, E. very good/good/N/A.. bright gilt titles & pictorial spine, front cover illust. of white hunter in black, pink & white (slightly faded}, col. frontis. & 2 of 3 col. illusts. (vignette missing), title page in red & black, A volume in 'Nelson's Travel Series'. undated though facing front cover attractive gilt & coloured prize label gives 1919 & stamped above - "Sons of Temperance, Hope of Histon (Cambs.) Division", 192 pages. Size: 12mo - over 6¾" - 7¾" tall. Illustrator: Stewart, E. Quantity Available: 1. Category: Children; Africa; Travel & Places. Pictures of this item not already displayed here available upon request. Inventory No: CHD00072.